I have satisfied an urge to become a monk. Although answers I sought has now been replaced by more questions. Through short and intense training of the so called vipassanā meditation (vipassana meaning; insight into the true nature of reality) I now inhibit a new experience of introspection on mostly the physical level. I realized a very interesting phenomenon occuring in our human bodies, in an endless sort of ‘appearing and disappearing’ manner (destruction and creation? ), in forms of energized tiny vibrations. My initial training in this technique resided around various buddhist teachings. More specifically, teachings that proclaimed itself being over 2500 years old, leading back to the time when Siddhartha Gautama, also known as the Buddha, re-discovered this technique (re-discovered, as they say. I wonder who, or what, discovered it before him). I find myself, not disapproving their philosophy or theories, but a willingness inside me to broaden my perspective. The ancient asian Qi principle has long been branded as mere “mythology” in modern times. I must say though, the thought of this “energy flow” is not so far away from my physical experience, thus my interest. While this can be a complete coincidence, I can imagine that the ancient people of asia that came up with this “theory” or “principle” of Qi, experienced something similiar as I have. How many other “energized”, “electric flows” through the body can we have? If this is the case, and i’ve come across a physical sensation/stimuli that resembles the Qi, and in short, one of the inspirations of the so called The Force, featured in Star Wars… Then I’m even more satisfied. In any case, an interesting thought around this is what this actually is – the feeling itself. The possibility of it being a mere illusion is slim, very slim. Taking into account all the thousands of people that has ventured and done these courses in modern day society, and gotten the effect. Even on my course, I saw the most sceptical around at least getting these vibrations in his face. While I haven’t found any real truth of this, one may take into account that modern science hasn’t really gotten that far in explaining the tiniest of particles just yet. Leaving this idea to be a mere theory of self-experience, as you are supposedly about to experience this as you reach nibbāna (nirvana), or the disintegration of the mind and body. Nevertheless. Whatever these sensations, vibrations, indications and/or life force really is, the most important question may be; how does it really affect our daily lives and the way we think? The buddhist philosophy talks of impurities that are getting abolished while practicising their method of observing these vibrations. 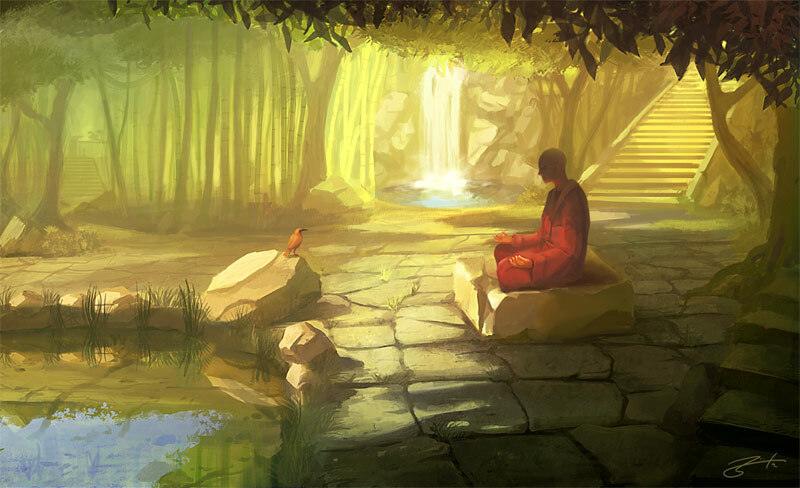 There are several branches who practices to balance Qi, such as Qigong, but also Feng shui, certain martial arts. Lastly, acupuncture, the use of needles to access different parts of the meridians and make Qi flow more easily in the body, has actually scientifically proven to be successful in treating various sicknesses and symptoms of pain. I will meditate further, and dive into this sea of ‘awareness’.. That frankly doesn’t seem to have a straight answer to anything.